A zombie comedy set in Havana, Cuba, Juan of the dead is pretty good fun and although its satire is not subtle, it is quite effective. The zombie virus seems to have spread directly from Guantanamo Bay, as Juan and his friend Lazaru discover an orange suited ghoul floating in their fishing patch, and proceed to harpoon the creature in the head. â€œWe never talk of this again, okay?â€ On arriving back on dry land the pair think nothing of the incident and proceed with their lives as poverty stricken citizens. Juan wants to reconnect with his estranged daughter; Lazaru just wants to get laid. The living dead continue to mount, until the government can no longer deny the outbreak and blames is solely on the U.S. who must be paying dissidents to eat Cubans. As I said, not subtle. I very much liked the diversity of the group we follow. Thereâ€™s a sassy transsexual called China whoâ€™s handy with a catapult, her boyfriend the huge black giant who is terrified of the sight of blood and so fights blindfolded, the overweight and clumsy Lazaru, Juan himself is good at free-running and his daughter is skilled with throwing stars. Thereâ€™s also the obligatory handsome scruffy stoner who falls for Juanâ€™s daughter looks good in a vest. The group face numerous threats beyond the zombies, including government swat teams who think nothing of strip searching and arresting our heroes (again, not subtle). As the film proceeds along its ninety minute journey we get scores of references to the old zombie films of yore, and I was happy at spotting them and ticking off my mental check list. I was also glad to see that in this film death = zombification, not just a bite (which ruined the remake of Dawn for me â€“ I always liked Romeroâ€™s rules best). 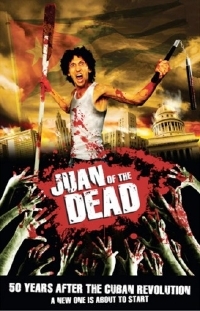 Thereâ€™s not much more to say about Juan of the Dead, itâ€™s basically a nifty zombie comedy with lots of inventive gore and spirited performances from all the cast. Itâ€™s not the cleverest or most original film, but to see this coming out of Cuba is heartwarming as the government usually controls the output of Cuban cinema in quite harsh fashion. As the festival head joked in her intro, perhaps they simply put the film on a raft and pushed out to sea. Iâ€™m glad someone found it.